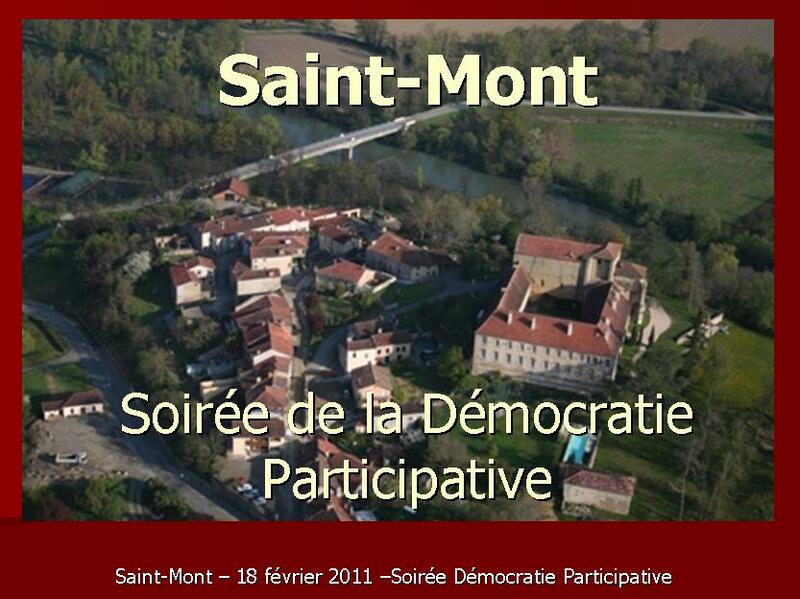 The night of the participative democracy took place on Friday, February 18th, 2011 in the foyer of Saint Mont, in front of around thirty people. The mayor, Michel PETIT reminded why of this public meeting in particular a major principle in participative democracy: the obligation made for the elected representatives to consult the citizens because the latter did not sign them a blank check! 5) Promote the image of SAINT MONT. Every councillor, organizer of a commission, was so able to review the overhang of the action plan. The latter is realized in almost 70 %. Then, a second point dealt with the municipal map (carte communale). The building zones and the zones of activity were presented to the public. Joël BOUEILH, organizer of the commission, was so able to explain the major principles of a municipal map. The third point concerned the traffic in the village. The principle is held to limit to it the speed to 30 kilometers / hour. Furthermore, the car park will be authorized only in the reserved zones. Finally, there was a debate with the persons before joining the bar where waited for them the cup of the friendship. The slide show presented during the evening is downloadable below.